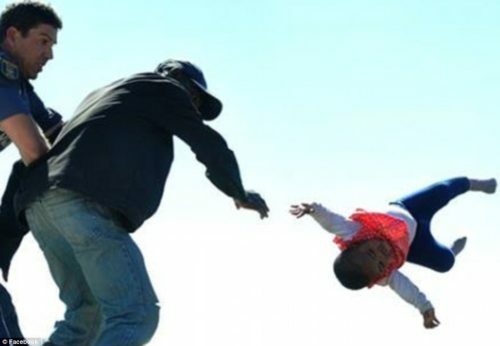 A 38-year-old South African man has been charged with attempted murder after he threw his six-month-old daughter off the top of a shack in an illegal township in Kwadwesi, near Port Elizabeth on South Africa’s eastern cape coast. The South African government had marked the man’s shack among others for demolition. 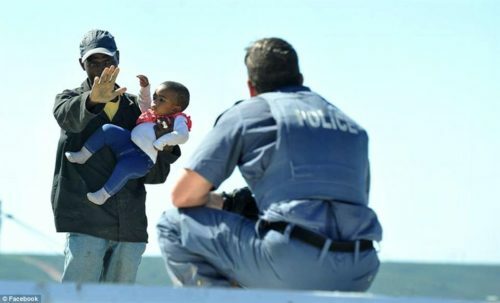 As policemen arrived the area for a safe demolition, the man took his baby and climbed on top of their home to protest just as 150 protesters began serious rioting throwing bricks and closing off roads with burning tyres. 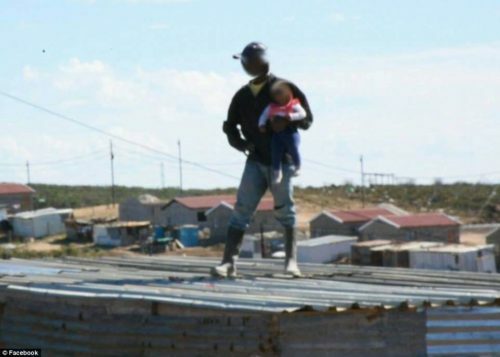 As calm was being restored, this man climbed onto the roof of his shack with his child and threatened to throw her to her death if the demolishers did not back off and leave his home alone. When negotiators failed to talk him down a rescue plan was launched. Immediately, half a dozen policemen lined up on the ground below him and one climbed up to try to talk to him. But the man dangled the baby over the edge by her ankle, threatening to swing her over the edge. Township protesters could be heard egging the agitated dad on with chants of: ‘Throw, throw, throw’. 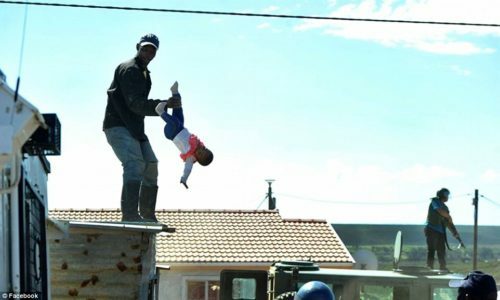 Photos show the police officer on the roof rushing forward to grab the father but unfortunately couldn’t as he had already thrown the baby.